Jobs began to come back to Illinois in January 2010. But even since then, job creation hasn’t kept up with the needs of Illinois families. 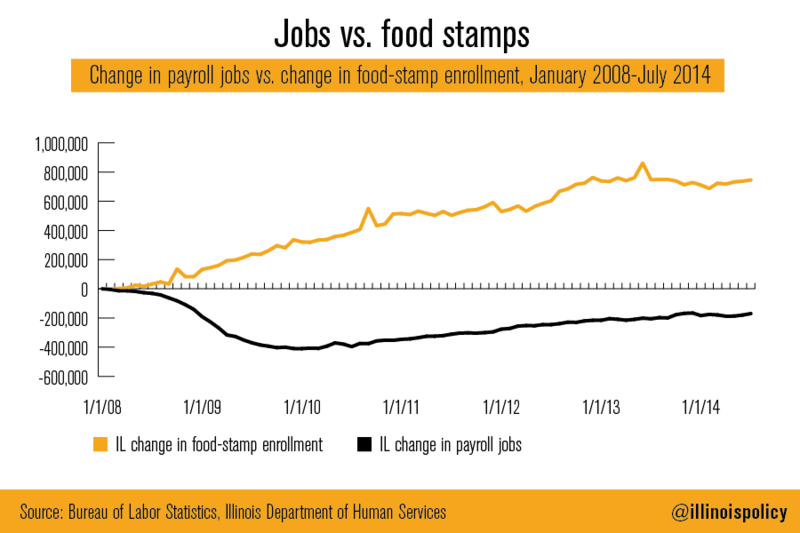 Food-stamp enrollment has outpaced job creation by nearly 2-to-1 during Illinois’ jobs recovery, from January 2010-July 2014. The pace at which Illinois has been creating jobs is simply not good enough for Illinois families, and policy mistakes, such as the historic 2011 tax hikes, have made it worse. Illinois has gained only 240,000 jobs since the bottom of the recession, while food-stamp enrollment has gone up by 420,000. 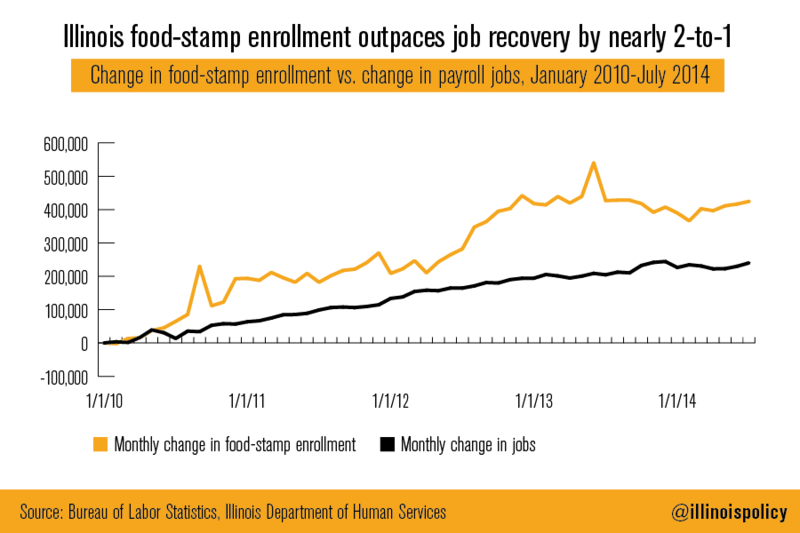 Even this year, as policy leaders claim the state is amidst a recovery, food-stamp enrollment continues to surge. Over the first seven months of 2014, Illinois is dead last in the U.S. for private sector job creation, having lost 5,900 private sector jobs. Food-stamp enrollment has surged by 17,000 over the same time period. There are now over 2 million Illinoisans dependent on food stamps, and more than 1 million in Cook County alone. That means that one in five residents of Cook County depend on food stamps just to get by. Lawmakers need to jump-start entrepreneurship and embrace structural reform in order to get the economy going again. 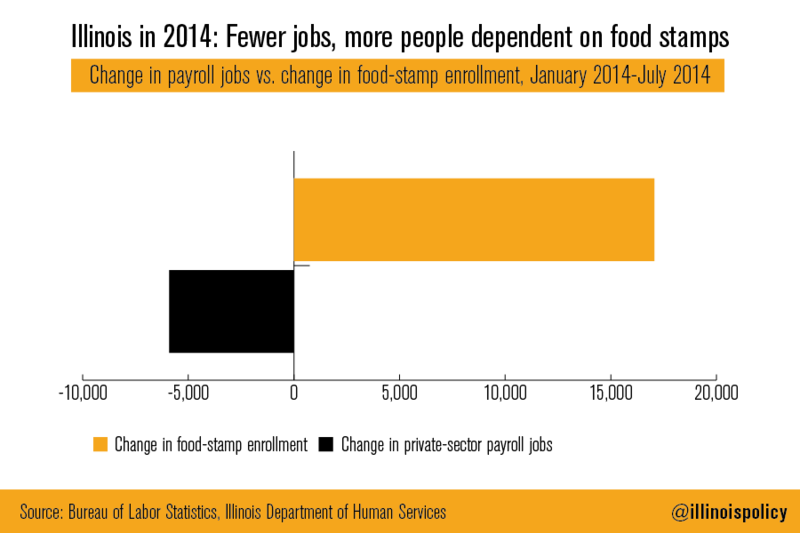 Without a fair shot at work, Illinoisans are forced into food-stamp dependency.